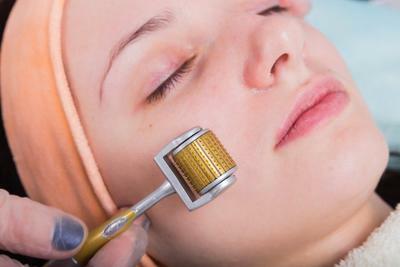 Microneedling as the name suggests is a procedure intended to cause controlled micro-injuries to the skin, encourage the body's innate ability to heal itself and hence facilitate new collagen production. It can additionally be used to deliver active ingredients to the deeper layers of the skin and hair. It can be achieved by a dermaroller or a dermapen. Dermaroller is a hammer shaped instrument made of pure stainless steel with high quality titanium sharp needles.Dermapen, also called a microneedling pen is a motorised device more suited for deeper localised scars. Microneedling is used in a wide range of conditions from aging skin, rejuvenation, melasma, acne scars, traumatic scars, open pores, stretch marks to be an adjuvant to PRP of face and hair. Prior to the procedure, a numbing skin is applied to the face for half an hour. The dermaroller is rolled on the skin in a sequential fashion to create hundreds of tiny channels. After the procedure, the skin might look a little red and swollen for a day or two. The results are seen after 2 to 3 weeks.The session can be repeated after a month. The skin becomes firmer, lines become less deep, scars become shallower, open pores reduce in size and the skin looks healthy.